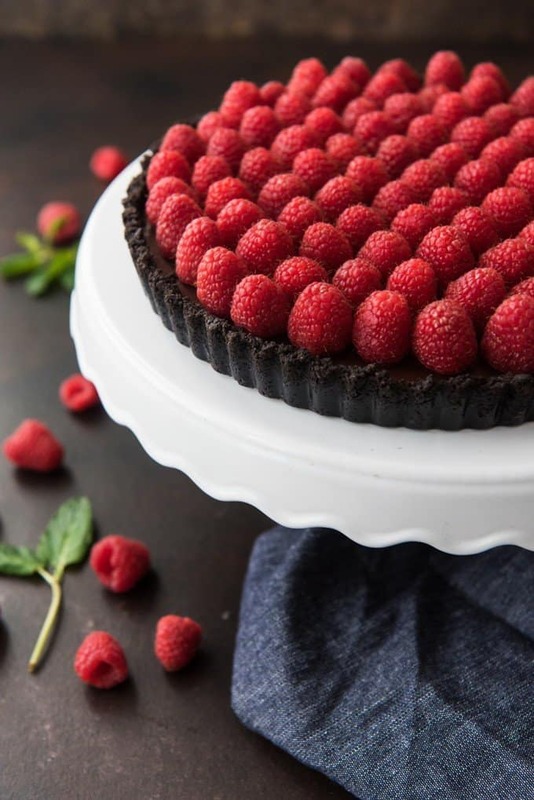 A smooth, rich chocolate ganache poured into a chocolate Oreo cookie crust and then toppped with lots of fresh red raspberries makes for a deceptively easy and decadent dessert in this Raspberry Chocolate Tart that’s perfect for Valentine’s Day or any special occasion! 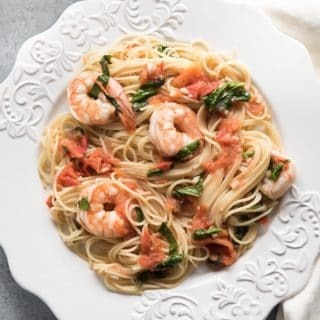 It’s February 1st and that means some of my favorite food blogging friends and I are sharing recipes today around the same theme! Last month we shared some of our best sliders recipes to help you get ready for Game Day. But for February, we thought chocolate desserts would be appropriate, given the upcoming lover’s holiday! Scroll all the way past the recipe to see what everybody else came up with! 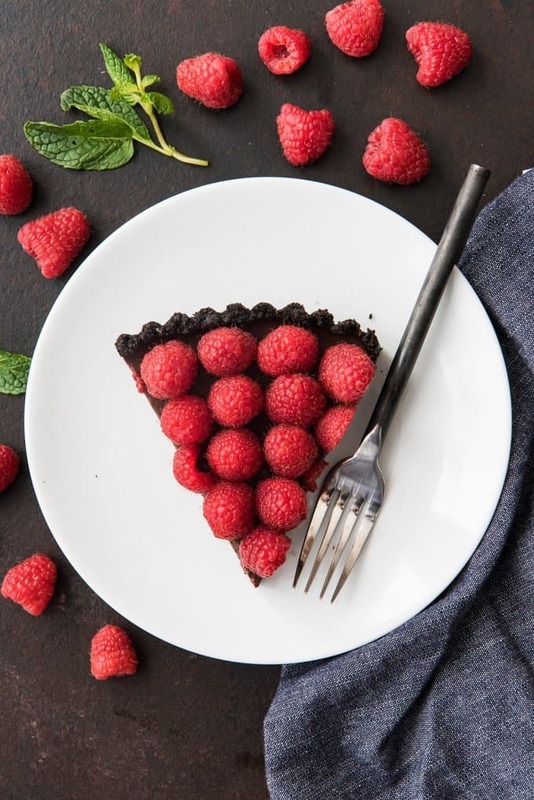 But first, a little about this raspberry chocolate tart! When it comes to chocolate, I actually typically prefer it combined with either nuts or fruit. Like in these Chocolate Covered Strawberries that I shared last year, which are another great Valentine’s Day idea for your sweetie. Raspberries and chocolate were made for each other. 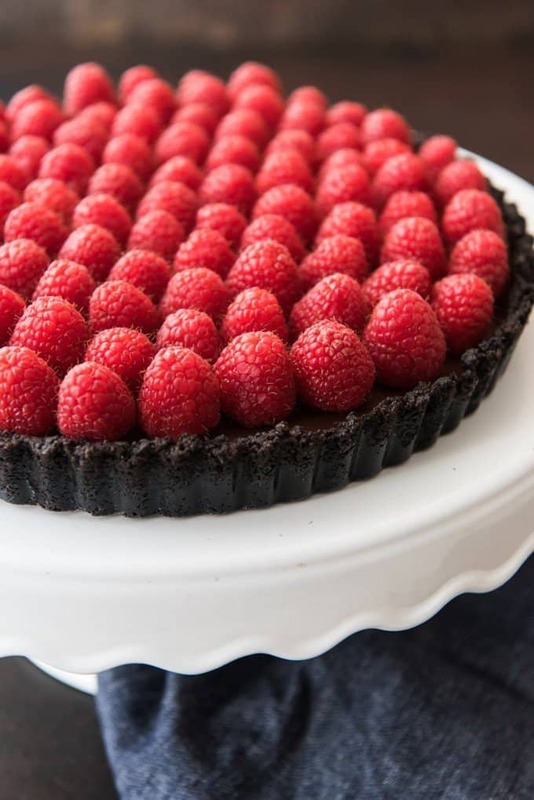 The bright, sweet-tart flavor and juicy texture of the raspberries just bursts in your mouth with each rich, smooth, deeply chocolatey bite of this tart that couldn’t be simpler to make. My girls were groaning with delight while devouring their slices of this dessert after I finished photographing it. I made one large tart that I sliced into individual wedges for serving, but if you have individual size tart pans you could make tartlets out of this same recipe and they would be so sweet! This Raspberry Chocolate Tart is really two parts, but they couldn’t be simpler. 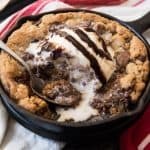 First is an Oreo cookie crust that is made by combining finely crushed Oreo cookie crumbs with a little bit of melted butter and pressing it into a tart pan. There is no need to scrape out the cream filling in the middle of the Oreos before crushing them. It actually helps the crust bind together better than using plain chocolate wafer cookies. I find that using a glass or smooth-bottomed measuring cup works best to press the crust into a tart pan, making sure the crust goes up the sides of the pan. If you don’t own a tart pan, you could absolutely just use a pie pan instead. 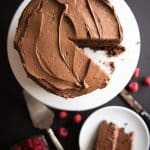 After a quick bake in the oven, the crust can cool while you prepare the chocolate ganache filling, which is literally just chopped chocolate and hot cream that are stirred together until the chocolate is melted and a smooth ganache has been created. 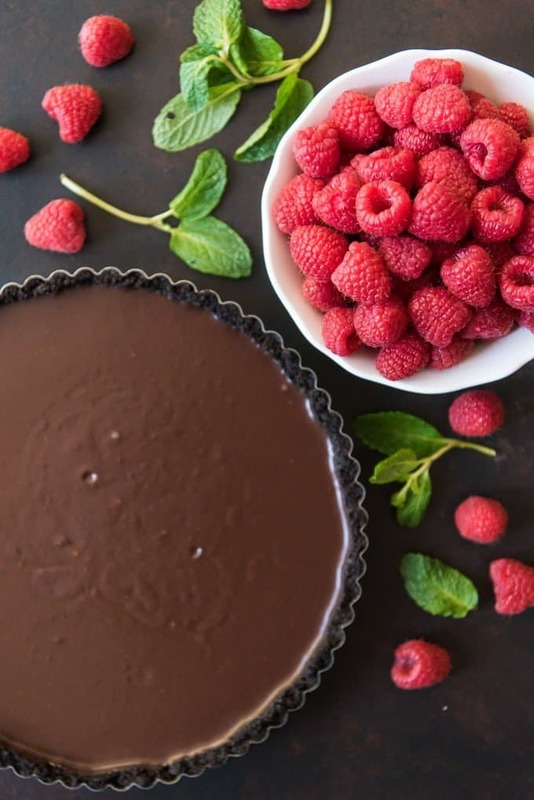 You could just use chocolate chips if that is what you have on hand, although with an intensely chocolate dessert like this, I prefer to use the highest quality chocolate I can get and I like dark chocolate over milk chocolate for this raspberry chocolate tart. Some of my other favorite ideas for Valentine’s Day are these wonderful, rich Chocolate Molten Lava Cakes or these Disney-inspired Jolly Holiday Raspberry Rose Macarons piped into the shape of hearts. Or use heart-shaped to make Chocolate Cut-Out Sugar Cookies! I will be chaperoning a Valentine’s dance this February 14th for a couple hundred 12-18 year olds while my better half stays home and puts the kids to bed since all our regular babysitters will be at the dance! Not the most romantic plans, but then, I’m not much of a romantic. What are your plans for Valentine’s Day this year? 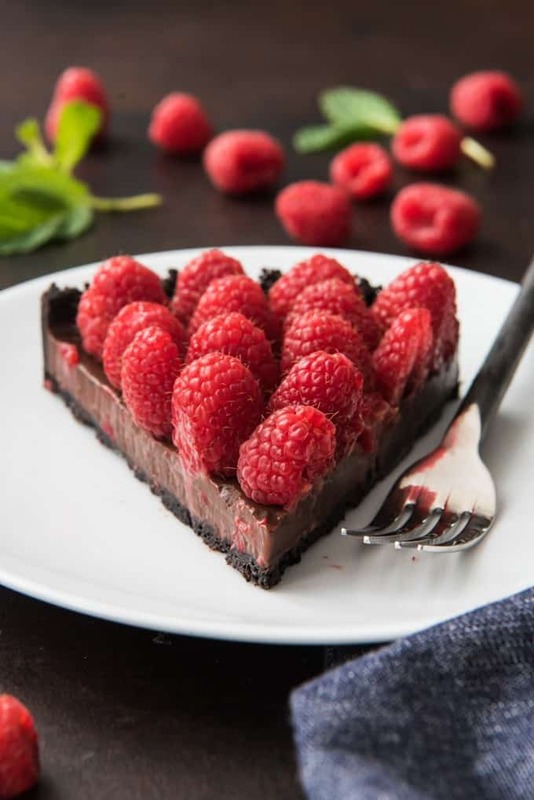 A smooth, rich chocolate ganache poured into a chocolate Oreo cookie crust and then toppped with lots of fresh red raspberries makes for a deceptively easy and decadent dessert in this Raspberry Chocolate Tart that's perfect for Valentine's Day or any special occasion! Mix the cookie crumbs and melted butter together in a bowl, then press the crust ingredients firmly into the bottom and 1 to 2 inches up the sides of a tart pan. It can help to use a glass or flat-bottomed measuring cup to do this step. Bake the crust for 8 minutes, then remove from the oven and cool completely. Meanwhile, place the chopped chocolate into a heat-proof bowl. Heat the heavy cream in a small saucepan over medium-low heat until very hot but not boiling. Pour the cream over the chocolate and let it sit for four minutes. Then stir using a rubber spatula until the chocolate is completely melted and the chocolate and cream are combined. Pour the chocolate ganace over the Oreo cookie crust and smooth out the top, if necessary. 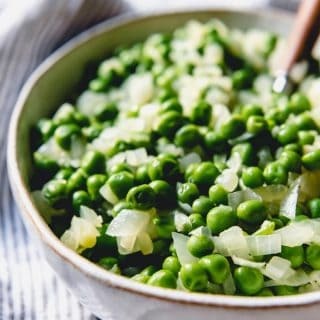 Place in the refrigerator and let set for 2 hours. When done chilling, decorate the top with raspberries by arranging them with the conical side up, closely touching. If desired, dust with powdered sugar before serving. 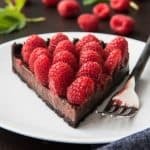 The preparation time noted in the recipe includes time for chilling the chocolate tart in the refrigerator before topping it with raspberries. 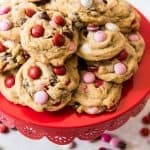 Looking for even more Chocolate Desserts for Valentine’s Day? Be sure to check out these amazing recipes below from some of my favorite food blogging friends! 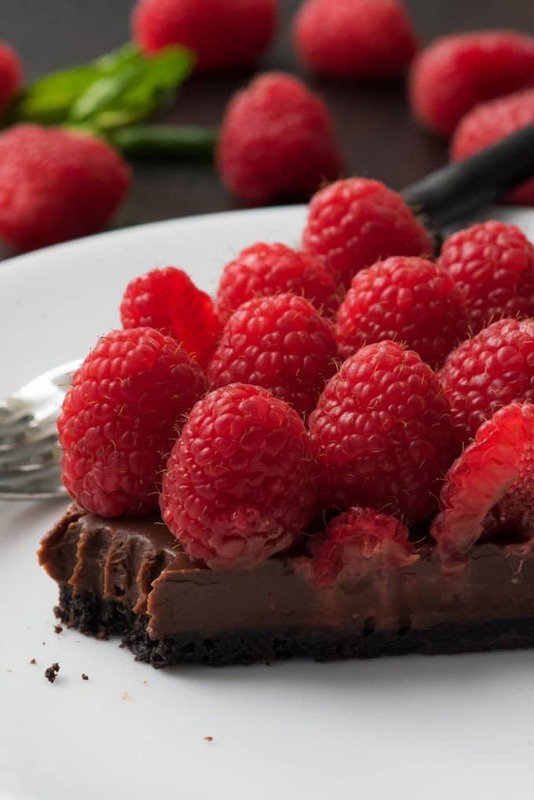 I love raspberries and chocolate together – this tart is absolutely perfect. Pinning! 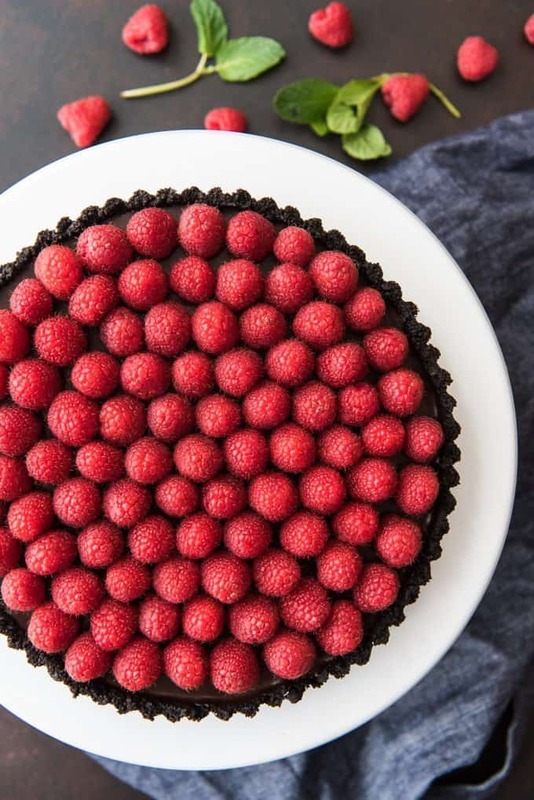 Raspberry and chocolate is such a delicious combination and this tart looks beautiful. Perfect for Valentine’s Day. Oh gawd this looks delicious. And SO simple! There’s hardly any ingredients, I absolutely love it. I’m so inspired to make this for an upcoming Galentine’s Day party! This sounds fabulous and perfect for Valentines Day! What a great combo between the chocolate and raspberries and this really does pretty easy to make. Now this is exactly what I want to make for Valentine’s Day! One of my favorite combos-chocolate and raspberries! 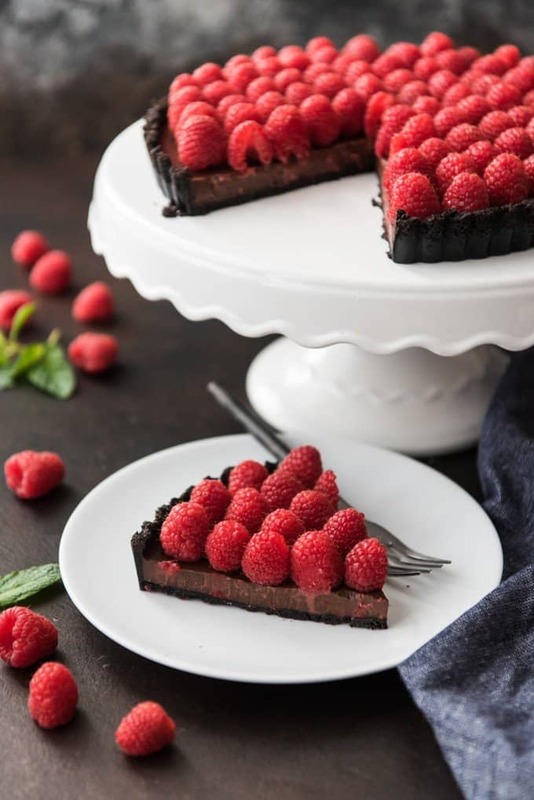 This Raspberry Chocolate Tart is calling my name…. It is absolutely beautiful. I am saving this recipe to make for Valentine’s Day. It looks like the perfect dessert to surprise my husband with. OMG. This tart is everything. I’m with you- I like fruit with chocolate. It cuts some of the richness so you can eat a little more:-) Plus it’s fruit, therefore it’s healthy, right? I’m so glad you enjoyed it! Blueberries sound wonderful!